Recently-released documents show that the FBI has been working since late 2011 with four states—Michigan, Hawaii, Maryland, and possibly Oregon—to ramp up the Next Generation Identification (NGI) Facial Recognition Program. When the program is fully deployed in 2014, the FBI expects its facial recognition database will contain at least 12 million “searchable frontal photos.” According to New Scientist, this program will cost $1 billion. Tests in 2010 showed that the best algorithms can pick someone out in a pool of 1.6 million mugshots 92 per cent of the time. It's possible to match a mugshot to a photo of a person who isn't looking at the camera too. 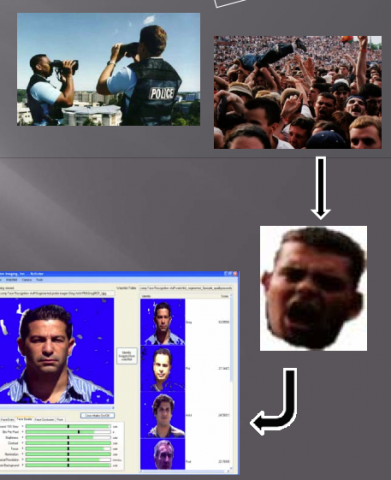 Algorithms such as one developed by Marios Savvides's lab at Carnegie Mellon can analyse features of a front and side view set of mugshots, create a 3D model of the face, rotate it as much as 70 degrees to match the angle of the face in the photo, and then match the new 2D image with a fairly high degree of accuracy. The most difficult faces to match are those in low light. Merging photos from visible and infrared spectra can sharpen these images, but infrared cameras are still very expensive. According to JENNIFER LYNCH, "FBI Ramps Up Next Generation ID Roll-Out—Will You End Up in the Database", one of the FBI’s goals for NGI is to be able to track people as they move from one location to another. Recent advancements in camera and surveillance technology over the last few years will support this goal. For example, in a National Institute of Justice presentation (pdf, p.17) at the same 2010 biometrics conference, the agency discussed a new 3D binocular and camera that allows realtime facial acquisition and recognition at 1000 meters. The tool wirelessly transmits images to a server, which searches them against a photo database and identifies the photo's subject. As of 2010, these binoculars were already in field-testing with the Los Angeles Sheriff’s Department. Presumably, the backend technology for these binoculars could be incorporated into other tools like body-mounted video cameras or the MORIS (Mobile Offender Recognition and Information System) iPhone add-on that some police officers are already using. Private security cameras and the cameras already in use by police departments have also advanced. They are more capable of capturing the details and facial features necessary to support facial recognition-based searches, and the software supporting them allows photo manipulation that can improve the chances of matching a photo to a person already in the database. For example, Gigapixel technology, which creates a panorama photo of lots of megapixel images stitched together (like those taken by security cameras), allows anyone viewing the photo to drill down to see and tag faces from even the largest crowd photos. And image enhancement software, already in use by some local law enforcement, can adjust photos"taken in the wild" (pdf, p.10) so they work better with facial recognition searches. Cameras are also being incorporated into more and more devices that are capable of tracking Americans and can provide that data to law enforcement. For example, one of the largest manufacturers of highway toll collection systems recently filed a patent application to incorporate cameras into the transponder that sits on the dashboard in your car. This manufacturer's transponders are already in 22 million cars, and law enforcement already uses this data to track subjects. While a patent application does not mean the company is currently manufacturing or trying to sell the devices, it certainly shows they're interested.